As you talk to her further, you realize she has a whole life mantra to live by: living your life. PALM HARBOR, Fla. -- What's the longevity and secret to life? If you ask 105-year-old Helen Granier of Palm Harbor, she would tell you, "I never expected to live this long, no one in my family ever did. I don't know!" As you talk to her further, you realize she actually has a whole life mantra to live by: living your life. "I used to drink beer, and I smoked, and everything. I stayed out late, you know, dancing, and then I would go to work." Turns out, Helen had quite the impressive life, including but not limited to living through the first world war. "I remember the first world war. I guess I was only three or four, but I remember my uncle came home to see my mother, who was sick." She even talked about her love for gambling and dancing, and the time she went to Las Vegas. "[My husband] wouldn't take me to Vegas, because he knew I liked to gamble. Oh, I loved to play the slot machines. So I went to Las Vegas after he passed." 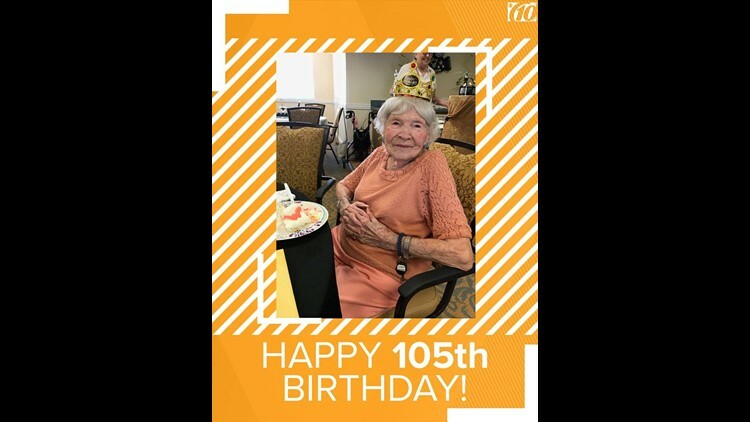 She celebrated her birthday Friday with a group of her closest friends at the Coral Oaks Independent Living Facility. She not only exchanged stories, she laughed about the good times. She's been a resident at Coral Oaks for nine years. When the group tried to guess when she started to drive, Helen swiftly replied,"I don't even remember when I started to drive!" For more on the interview and the all the wisdom she had to give, check out our 10News Facebook page livestream interview. Happy Birthday, Helen! You're a true inspiration to us all.